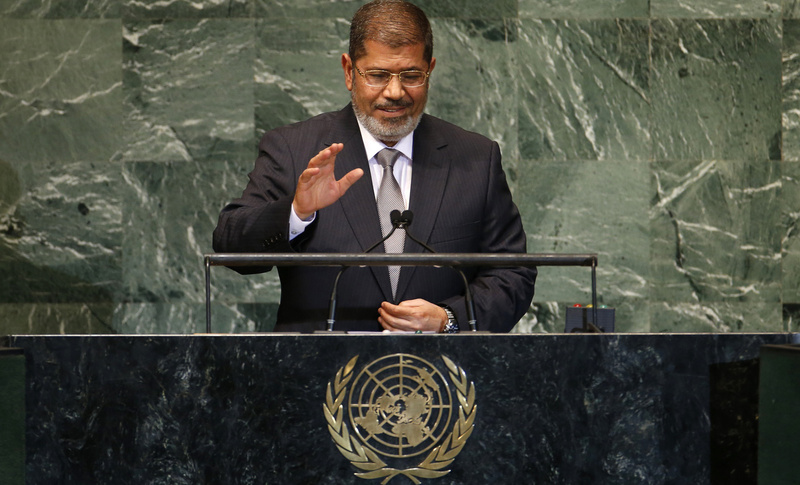 Egypt’s newly elected president, Mohammed Morsi, gave an historic speech at the United Nations General Assembly yesterday. The focus of Morsi’s speech was Palestine — yet you wouldn’t know it if you read the New York Times. The preoccupation of its reporter seemed to be the Egyptian leader’s omission of a stalwart defense of free speech. In other words, the New York Times, which prides itself as “the paper of record,” is acutely attuned to this constitutional and libertarian issue at the very same time that — more artfully than Izvestia ever did — it engages in self-censorship. At least in the Soviet Union everyone knew they were being lied to. The average reader of the Times on the other hand remains blissfully ignorant about the information that their trusted newspaper chooses not to report. The first issue which the world must exert all its efforts in resolving, on the basis of justice and dignity, is the Palestinian cause. Long decades have passed since the Palestinian People expressed their longing for restoring their full rights and for building their independent state, with Jerusalem as its capital. Despite their continued struggle, through all legitimate means to attain their rights, and despite the acceptance by their representatives of the resolutions adopted by the international community as a basis for resolving its problems, this international legitimacy remains unable until now to realize the hopes and aspirations of the Palestinian people. The resolutions remain far from being implemented. Our brothers and sisters in Palestine must also taste the fruits of freedom and dignity. It is shameful that the free world accepts, regardless of the justifications provided, that a member of the international community continues to deny the rights of a nation that has been longing for decades for independence. It is also disgraceful that settlement activities continue on the territories of these people, along with the delay in implementing the decisions of international legitimacy. Proceeding from the perspective of defending truth, freedom, and dignity and from my duty to support our Palestinian brothers and sisters, I place the international community face to face with its responsibilities which require the achievement of a just and comprehensive peace and the end of all forms of occupation of Arab lands, and the implementation of relevant international resolutions. I call for immediate and significant measures to put an end to colonization, settlement activities, and the alteration in the identity of Occupied Jerusalem. The entire Palestinian leadership has charted a clear path towards the restoration of the rights of the Palestinian people, within and outside Palestine. The Arab world has given it its full support. The latter has also presented a comprehensive peace initiative based on just peace. One that restores the usurped rights of the Palestinian People, is founded on international legitimacy, and lays the foundation of an independent sovereign Palestinian state. One that also achieves the security and stability the peoples of the region have long been waiting for. On that basis, I assure you of Egypt’s full support to any course of action Palestine decides to follow in the United Nations. I call upon all of you, just as you have supported the revolutions of the Arab peoples, to lend your support to the Palestinians in their endeavors to regain the full and legitimate rights of a people struggling to gain its freedom and establish its independent state. I say it loudly to those wondering about our position vis-a-vis the international agreements and conventions that we have previously adhered to: we are committed to what we have signed on. We also support the inalienable rights of the Palestinian people and are determined to pursue all efforts side by side with them until they regain their rights. To reiterate: “The first issue which the world must exert all its efforts in resolving, on the basis of justice and dignity, is the Palestinian cause” — but apparently it’s the last issue that concerns the New York Times. But this was not the only noteworthy feature of Morsi’s speech. Repeatedly he referred to Egypt as an African nation, underlining its pivotal place joining two continents and positioning the new democracy not only as a leader of the Arab world but more broadly the developing world. The New Egypt is determined to regain its standing among nations, and assume an effective role in global issues, stemming from the will of its people, as well as the legitimacy on which its regime is founded. This will is rooted in Egypt’s ancient and modern history, its Arabic and Islamic spheres, as well as its African identity. Egypt’s involvement in Arab, Islamic and African issues is the reflection of the essential role it plays in defense of interconnected fates and interlinked interests and values. Egypt is committed to pursue the sincere efforts it has been exerting to put an end to the catastrophe in Syria, within an Arab, regional and international framework. One that preserves the unity of this brotherly state, involves all factions of the Syrian people without racial, religious or sectarian discrimination, and spares Syria the dangers of foreign military intervention that we oppose. The will of the people, especially in our region, no longer tolerates the continued non-accession of any country [namely, Israel] to the Nuclear Non-Proliferation Treaty and the non-application of the safeguards regime to their nuclear facilities, especially if this is coupled with irresponsible policies or arbitrary threats. In this regard, the acceptance by the international community of the principle of pre-emptiveness or the attempt to legitimize it is in itself a serious matter and must be firmly confronted to avoid the prevalence of the law of the jungle. Cognizant of the danger that the status quo entails on the security of this important region, with its natural resources and trade passages, Egypt stresses the necessity of mobilizing international efforts to hold the conference on achieving a Middle East free of nuclear weapons and all other weapons of mass destruction before the end of the current year 2012, with the participation of all concerned parties without exception. And I say it very clearly: the only solution is to get rid of nuclear weapons, and all weapons of mass destruction. But we also emphasize the right of all countries of the region to the peaceful use of nuclear energy within the framework of the NPT, with a commitment to honor their obligations in this respect and provide the necessary guarantees to the countries of the region so as to remove any doubts surrounding their intentions. Noting that the United Nations in its structure still enshrines the inequities of a bygone era, Morsi called for a new order based on equality and mutual respect. Egypt would like to stress that the international system will not get fixed as long as the application of double standards remains. We expect from others, as they expect from us, that they respect our cultural particularities and religious points of reference, and not seek to impose concepts that are unacceptable to us or politicize certain issues and use them as a pretext to intervene in the affairs of others. What Muslims and migrants are going through in a number of regions worldwide, in terms of discrimination and violation of their human rights, and vicious campaigns against what they hold sacred, is unacceptable. It is opposed to the most basic principles of the Charter of the Organization where we meet today. These practices have become pervasive enough that they now carry a name: Islamophobia. We must join hands in confronting these regressive ideas that hinder cooperation among us. We must act together in the face of extremism, discrimination, and incitement to hatred on the basis of religion or race. The General Assembly, as well as the Security Council, has the principal responsibility in addressing this phenomenon that is starting to have implications that clearly affect international peace and security. The obscenities recently released as part of an organized campaign against Islamic sanctities is unacceptable and requires a firm stand. We have a responsibility in this international gathering to study how we can protect the world from instability and hatred. Egypt respects freedom of expression. One that is not used to incite hatred against anyone. One that is not directed towards one specific religion or culture. A freedom of expression that tackles extremism and violence. Not the freedom of expression that deepens ignorance and disregards others. But we also stand firmly against the use of violence in expressing objection to these obscenities.